Well, sort of. Mentally, I'm ready for this. I had a good run in September during Vegan MoFo until I got really sick and then things just went downhill. I was so tired. All I wanted was convenience. I just ate so much crap during and after that and I have never really fully recovered. Cheese. Dairy. Yes, even meat, sadly. No better time than the New Year, though. Renewal. New Beginnings. Motivation. I've got it now. Of course, I say this and part of it, I know, is because my husband is out of town and I'm not thinking about what it's going to be like when he gets back and I'm once again cooking for someone who doesn't really want to be full-on vegan, full-on all the time. It's hard sometimes when you're the one who does all the cooking. I feel a certain pressure to throw some chicken into the slow cooker for he and my son. Although, I feel like if I cooked some sort of beans or lentils every single day, they wouldn't complain. I am lucky in that respect. They love some legumes. I've joined a 21-day Kickstart program. And last night I stayed up watching some Neal Barnard videos on YouTube. He's coming out with some new work regarding Alzheimer's and if nothing else, that will be the thing that I will have to use to motivate my husband. His Noni had it really bad and became mean and experienced a long decline. they lived with her during a lot of this time as his mother was taking care of her. It's a really scary thing to him. He already doesn't cook in aluminum pots or use deodorant with aluminum, etc. 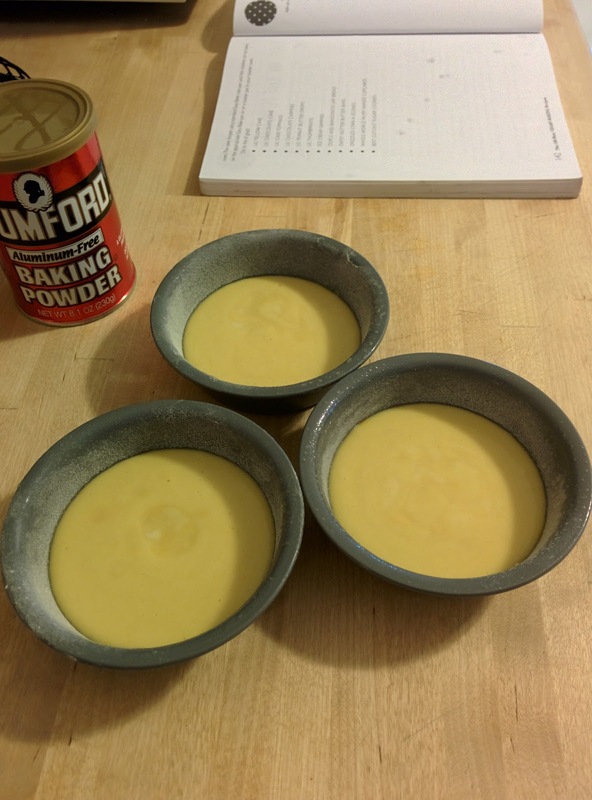 I quit using aluminum containing baking powder a long time ago. He does mental things to keep his brain sharp, etc. so there is already a large seed of concern there. The video I watched last night was very interesting and compelling to me. I'm not getting any younger and if there's time for me to reverse damage, I should just get on with it already. You may notice in the books up there that several are gluten-free. It's not because I feel like bread is inherently evil or anything. In fact, I love the stuff. LOVE it. Love making it, smelling it, eating it, using it to cook with, etc. My husband, however, has a problem with it when it's a regular or predominant thing. He avoids wheat when at all possible. Actually, it's not even the gluten he has a problem with. It's the other stuff in there (FODMAPs) that presents a problem for him. On top of that, I cannot stand the taste of most seitan which is entirely wheat gluten. I can handle it when it's just used in small amounts and some other flavor is dominant, but if it's just a slab of "wheat meat" then I can't take it. So, the whole gluten-free thing seems to give me options that work for everyone. As for my son and I, though, there will be bread baking and I have many much sourdough plans as I am obsessed with fermenting things right now! The last couple of weeks have been hell around here. Everyone is sick and it's holding on for dear life. It's moved into my chest. I'm not happy. I have been up since 3 a.m. puffing on my inhaler and struggling to breathe. Why do I have such a strong association with that certain non-vegan animal-based soup of my childhood when I have a cold? How can one person produce this much snot? Why did this have to happen during VeganMoFo when I was trying to hard to have a fresh start? Why does the weather have to finally be so nice when I'm sick and all I want to do is be in bed? Why is the light so bright? 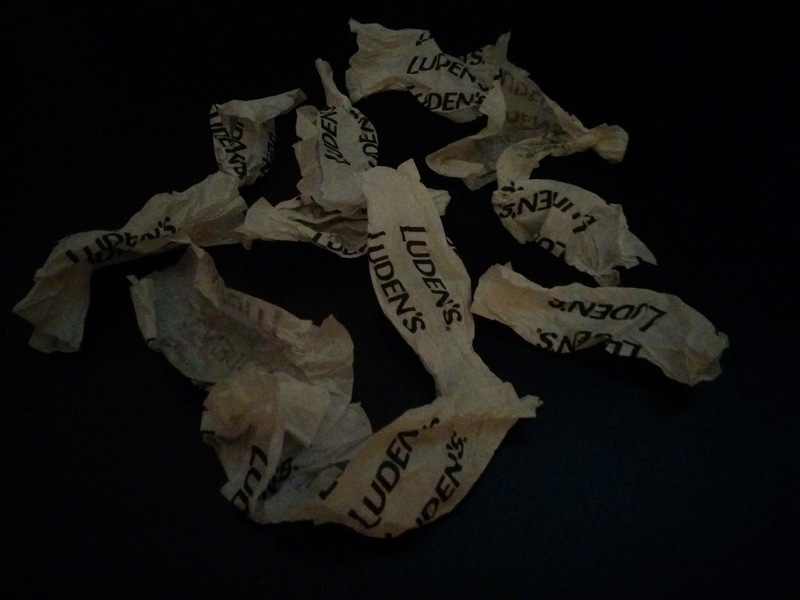 Will the area between my nose and mouth ever heal? Where will I get the strength to stand up in the shower? Answers to those and other questions when this finally subsides. Until then, wishing all of you good health! These are the Chocolate Cherry-Filled Cookies from page 42 if you're following along. I got the Tart Montmorency cherries in bulk at Costco. 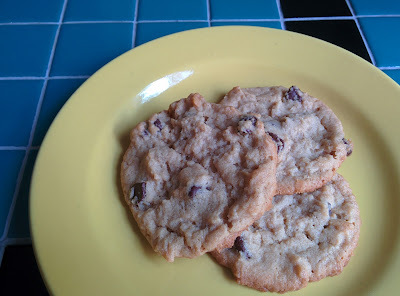 Well, I should say that my kid got them and I stole some for this recipe. I am glad I used a tart one because this is a sweet cookie! 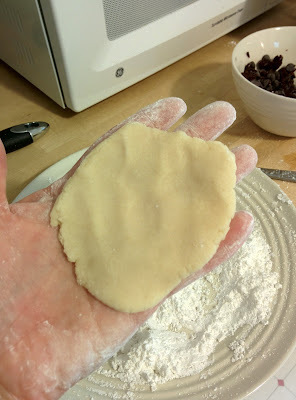 It is a pretty thick batter and I was a little worried about that, but it was perfect for patting out it my hand. 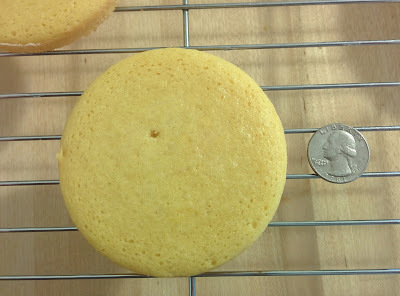 This is the first time I've ever made a cookie with a super secret middle. 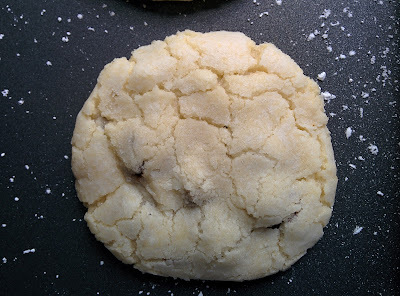 If you're looking at the cookie upon completion, as below, you can scarcely tell there's anything inside. But then if you bust it in half, there's a whole layer of cherries and gooey chocolate. First, you pat out some dough. Then you load it up with chips and cherries. 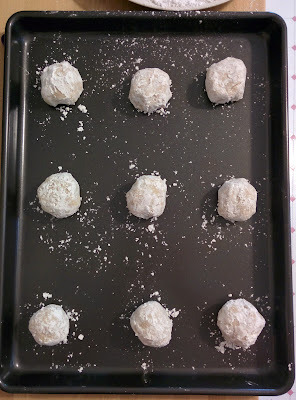 Then you roll it up in your hand and seal it all into a ball, then roll in a plate of powdered sugar. I mean, you roll the cookie in the sugar, not yourself. Although, I was covered in powdered sugar and my teeny phone speaker holes have powdered sugar in them now and I don't know how I will ever get that out. In hindsight, I probably could have gotten 12 on the pan, but they were so big and I was afraid they would spread into each other. I'm pretty proud of myself, too. Last entry I was bitching about how I always end up with way too many cookies. The recipe says it will make 24 and I end up with like a hundred. This time, I wound up with exactly 18 cookies as the recipe predicted. When I was done, I felt like I'd given birth on my due date or something. The consistency of these cookies is kind of like a snickerdoodle or a crinkle cookie but with a gooey middle of stuff. It has that crunchy, sweet bottom that I love in those types of cookies. I would definitely make these again, even though they were a little more work than your average cookie. Next time I might add cocoa to the batter so that I get some nice chocolate-on-chocolate action. Usually, I find that others have made what I'm making and I like to share links, but this time, I might be the first. Hopefully I am not the last because these suckers are good. You can visit the author of this cookbook on her blog nom! nom! nom! or on her Facebook page where she is pimping a new cookbook about vegan ice cream sandwiches. So far, so good. Nothing has sucked and this cookie recipe is no exception. It's just shot to the very top of my peanut butter cookie list. 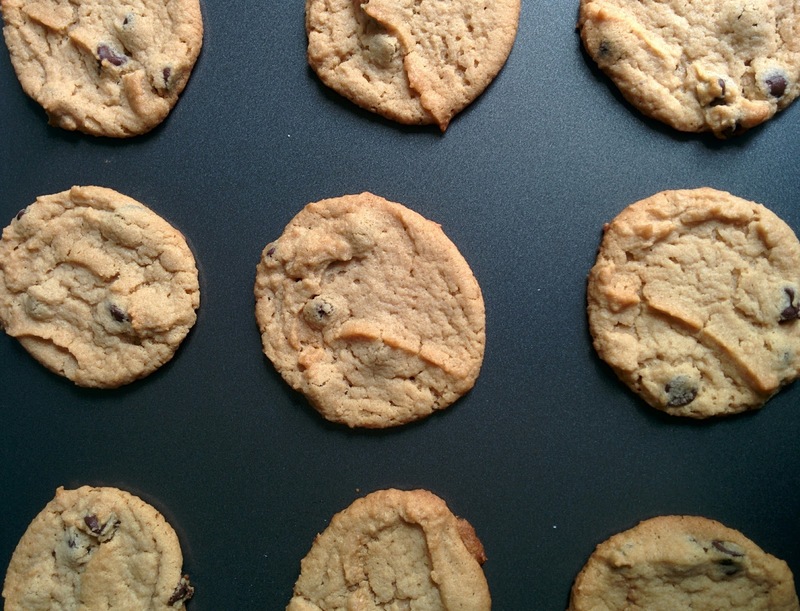 The edges are light and crisp and the center is chewy. This is just how I like 'em. You'll find this recipe on page 35. 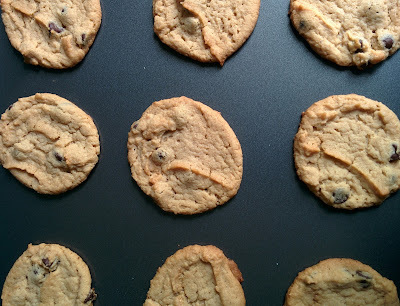 It didn't call for chips, but was a suggestion, so I added them because -- duh -- chocolate. 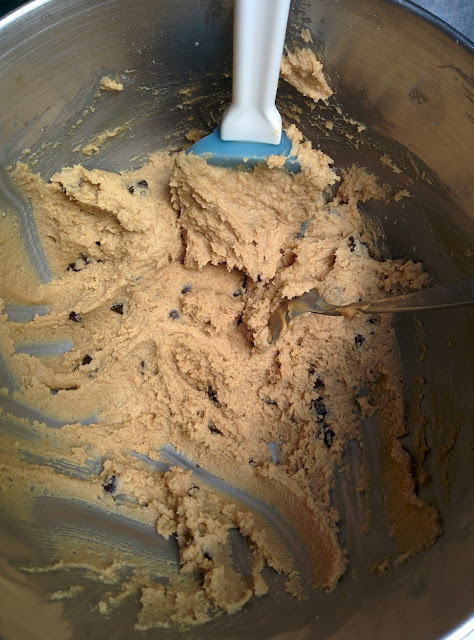 It called for 1/2 cup, but after mixing, I could barely tell there were chips in there so I added another 1/4 cup. I also didn't let them cool for the full 10 minutes on the pan. They didn't seem to need it. Also, I rarely ever cook with parchment paper, which it called for. This is a really fatty cookie recipe, so since my pan is already nonstick, I didn't want to waste the paper. That stuff is expensive. 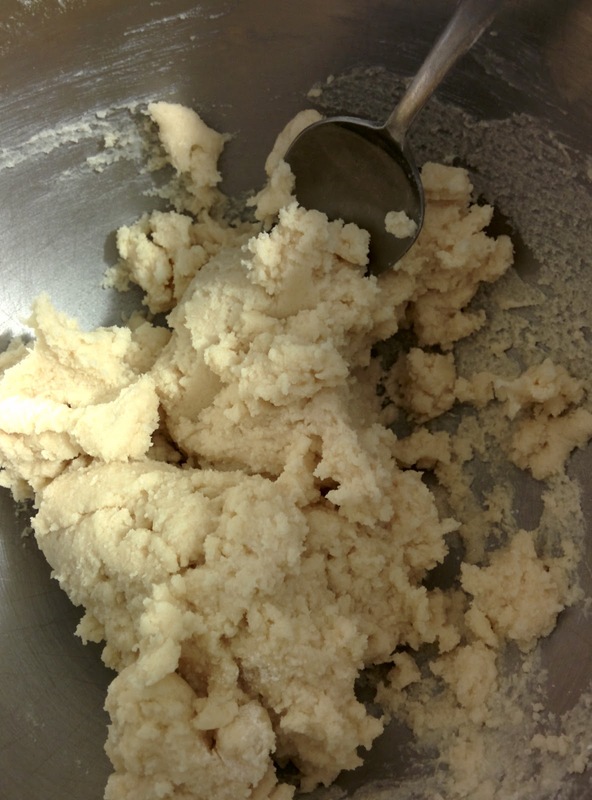 Here is a look at the batter. 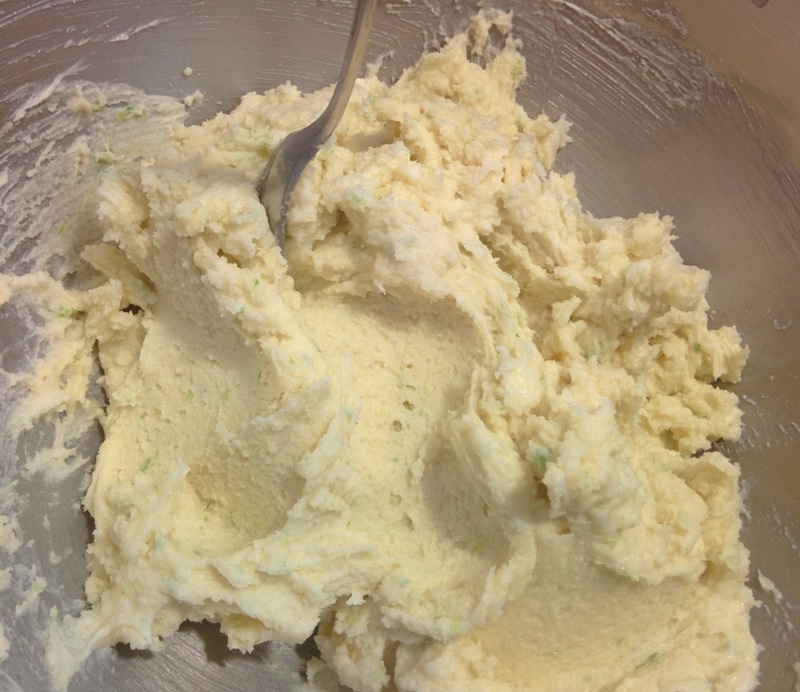 I don't know why I always post pictures of batter, but it's kind of helpful to know what it's supposed to look like. Sometimes vegan batters look a little different than nonvegan ones I was used to baking, so if I know what a batter should look like, it will keep me from making "corrections" like adding more liquid or flour before baking. I also did not mash them down with a fork since there were chips. I might have gone ahead with this step if I'd made them without chips, since I do like the little criss-cross marks. They spread and puffed up, and then as they cooled, they sunk into the shape you see here. The recipe made well over the 2 dozen it stated. I finished with a whopping 5 and a half dozen cookies. I have this problem a lot and I don't think it has to do with my cookie size, really. I mean, that pan usually cooks 15 at a time and I did 12 at a time this time. I guess the chips added to the bulk, but seriously, this is a recurrent problem I have even when I am using my scooper for uniformity. When I make a recipe I always like to find others who have made it, too, and link there so that you can see several examples of what it is supposed to look like or what mistakes others have made that you might be able to avoid. You can also visit the author of this cookbook on her blog nom! nom! nom! or on her Facebook page where she is pimping a new cookbook about vegan ice cream sandwiches. So, I'm flipping through the cookbook I'm cooking through right now. I realize that the recipe I made yesterday is very similar in style to the one on the next page, and that brings me to the conclusion that I don't want to cook straight through this, but rather I want to skip around. That way I'm not making 20 cookie recipes all in a row, either. I don't think there are any hard and fast rules in this cookthrough game, so I will do what I want. At any rate, I get to the back of the book and I'm sort of skimming and see this recipe for a cake that calls for 5 teaspoons of flour. I go back to the section's intro and realize that I have stumbled upon greatness. 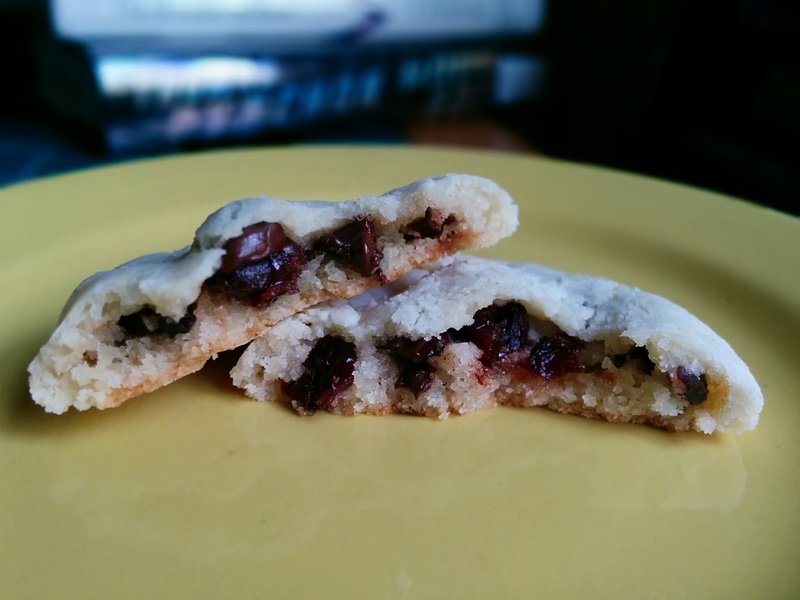 The author has veganized Easy Bake Oven recipes for children! And, well, for adults who like to be transported back to childhood, too! I just love the toaster oven. Squee! When I got this toaster oven, I bought a set of little pans. 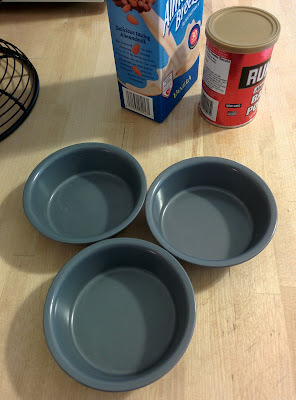 These are the mini rounds made by Wilton and come in a set of three. Aren't they adorable? And here they are filled with the batter. This recipe is on page 143 and the chocolate frosting recipe is on page 156. 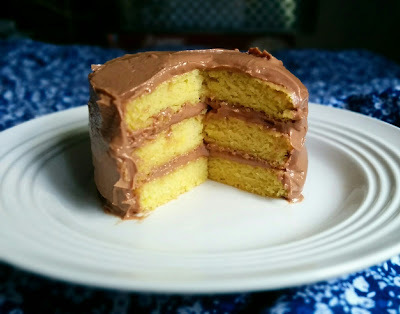 I tripled the recipe to make 3 layers and cut the frosting recipe in half. 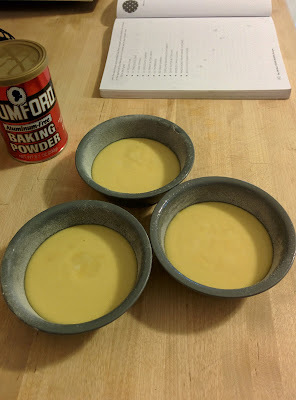 I was using Almond Breeze almond milk and the batter wasn't as yellow as I wanted, so I altered the recipe just slightly and added a few drops of vanilla and a pinch of turmeric for color. 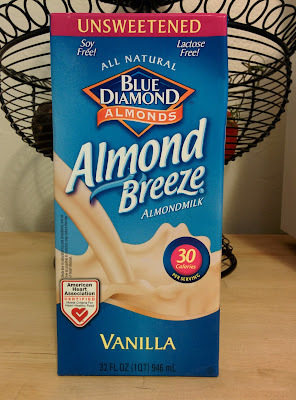 The best (and cheapest) almond milk is always the one that you make yourself. It's kind of ridiculous the price of this stuff considering what's in it. 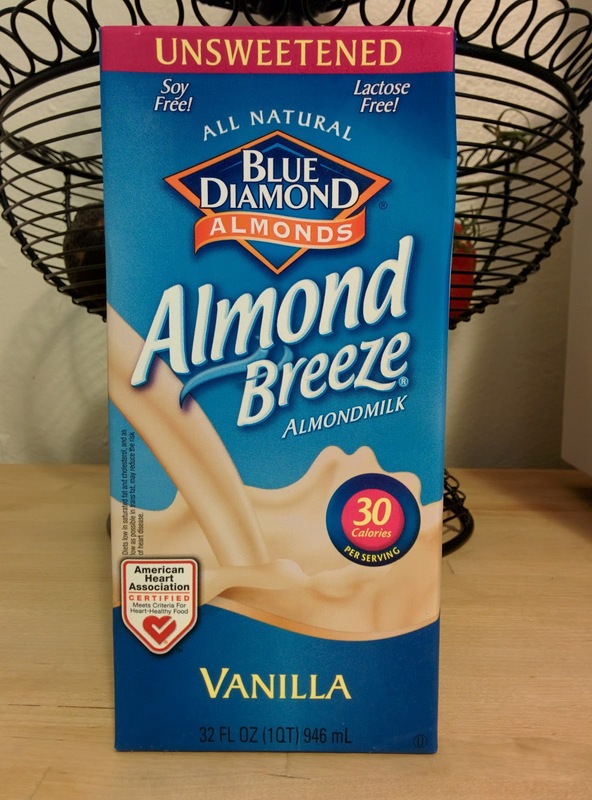 I can make my own with as little as 1/2 cup of almonds. Sometimes I'm in a hurry, though, like when I'm hangry in the morning and just want a damn bowl of cereal. I like this one because it's the one that Costco sells by the case and it's shelf stable. That means it's easy to take camping or on a road trip, too. Here is one of the finished cakes. Quarter shown for scale. Ha. JahLioness - a mix of two Lil' recipes to make a marble cake. Also points for cooking with an actual child! Today, I am in the mood for cookies. 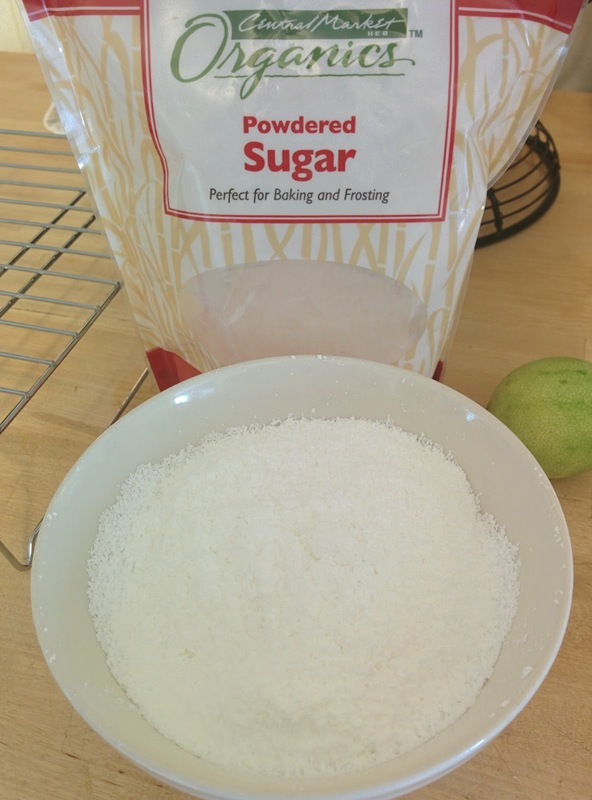 After all, it's 99 degrees outside which means it's not 100 or above, so perfect for baking, right? I just don't care any more. I'm so tired of waiting for this weather to cooperate with my baking needs. I'm ready for fall weather already. Disclaimer: I am not a super-skilled chef type person, just so you know, and I live in a house that is 964 square feet, so you can imagine how small my kitchen is. All this just proves you don't have to know how to cook to go vegan and you don't have to have a fancy pants gourmet kitchen set-up to make things that are edible. So, some things to know about this recipe. 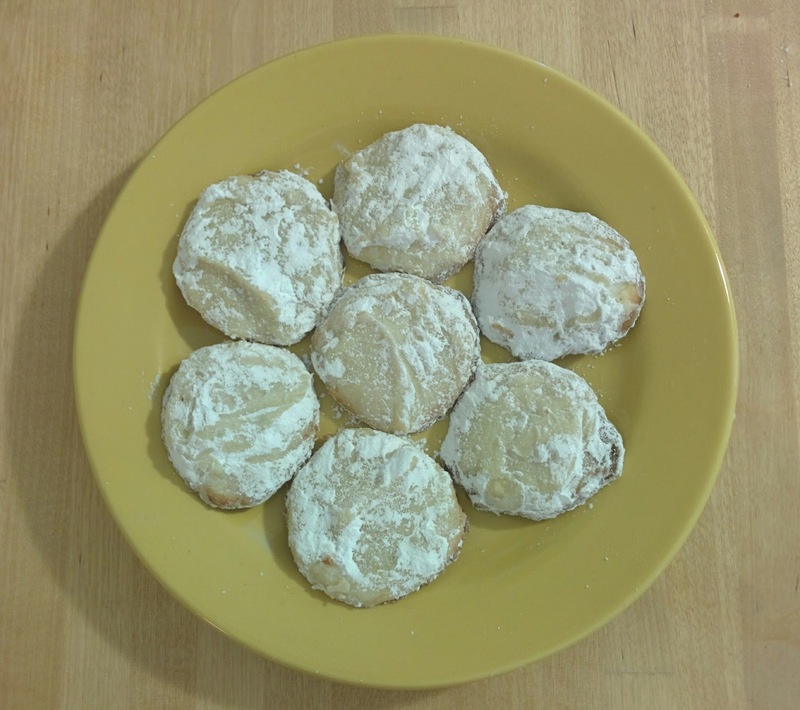 It is the Lemon Drop Cookies recipe on page 31. 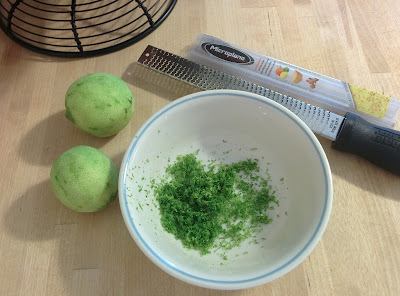 I was out of lemons, but just went to Costco and bought the mondo sized bag of limes, so I used those instead. I just got this insane zester, so I'm not sure if this recipe is actually vegan since it probably contains parts of my knuckles. I guess they were given sort of voluntarily, though. Probably still vegan. 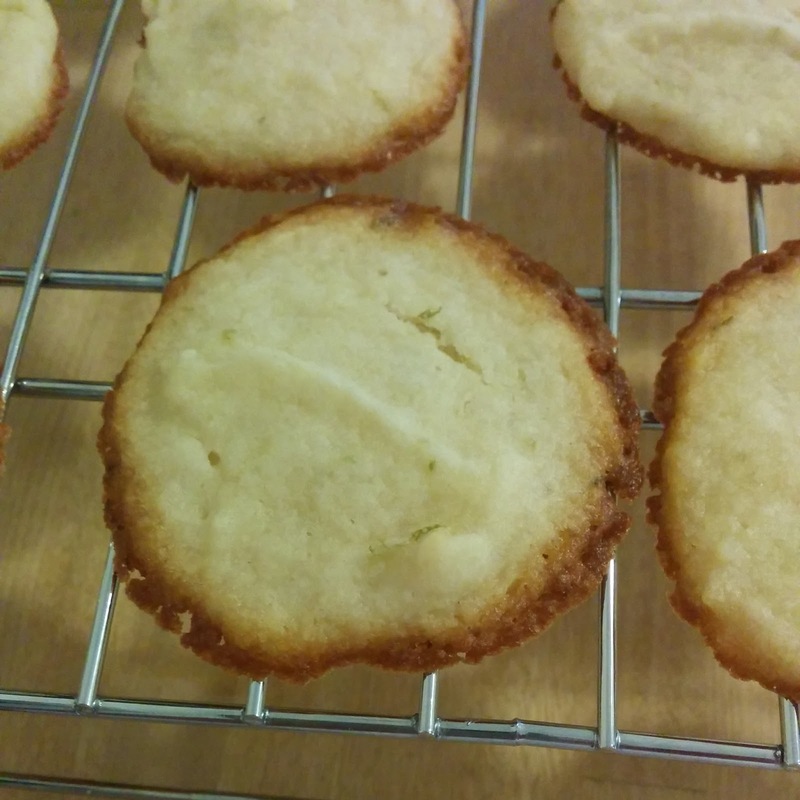 I also didn't have shortening, so that might have affected the consistency and shape of my cookies. These turned out sort of flat and not very drop-like. The Earth Balance sticks I had in the fridge had expired because I usually just use the Earth Balance in the tub and everything turns out all right. I forgot I even had shortening until this recipe called for it! I tried refrigerating the dough, thinking it might have been too warm and was spreading too fast. That didn't really help much. 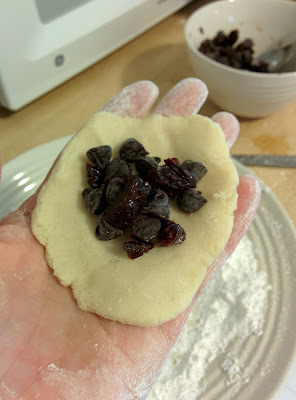 Next time I might try these at a lower temperature so they retain their shape or freeze the dough for a couple of hours before baking. 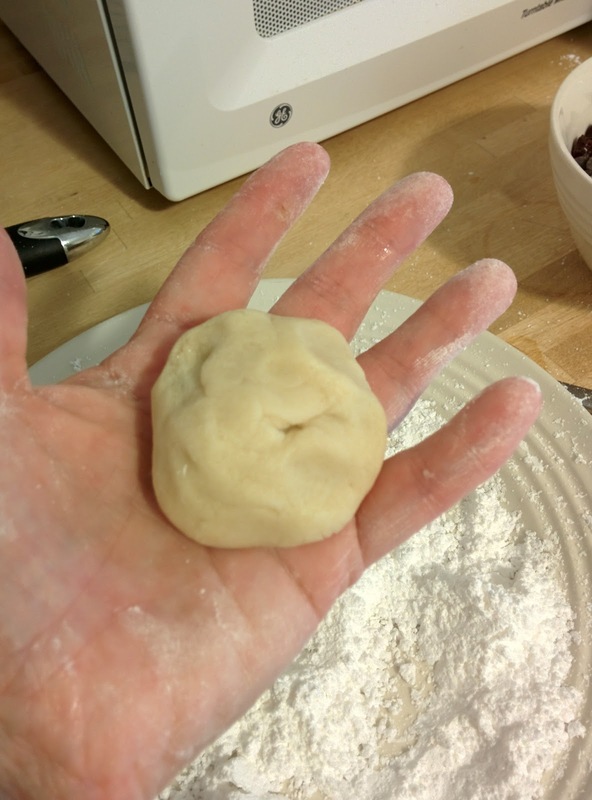 The dough was fluffy and light, and as with all eggless doughs, you can eat it raw. I was surprised that there was no baking powder or baking soda or salt in these, but then realized they are more like a butter cookie. The consistency was light and delicate and they were delicious! My son was wolfing them down faster than I could coat them with powdered sugar. That's another thing I would change in the recipe. It called for 1 1/2 cups powdered sugar, but I didn't use anywhere near that and would probably just use 1/2 cup for rolling next time or not roll them at all. They're great either way. The Author Herself - of course she has made them and they look so pretty compared to my little discs.